Honolulu, the capital of the newest state in the union, houses the largest airport in Hawaii to accommodate -- in large part -- the many tourists. Tourism is the major industry in Hawaii and Honolulu is the hub due to its location and infrastructure. Tourism is a 10 billion dollar business in the state of Hawaii and accounts for more than twenty percent of the Gross State Product annually. 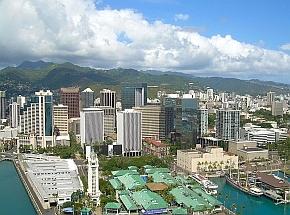 Honolulu is desirably located to serve as a trading post between the East and the West. Exports of clothing and food products constitute a portion of the economic landscape. Other industries include military and defense, manufacturing, and research and development. The unemployment rate in Hawaii as of November 2011 was only 6.5% according to the Bureau of Labor Statistics, which is a far cry from the 8.6% across the United States during that same period. This environment is prime for job seekers who are skilled in the aforementioned industries. Additional information on the local economy and key employers... Wikipedia: Honolulu Economy.